On this eve of Thanksgiving Day, I am very thankful and grateful for many, many BLESSINGS in my life. There are so many! On a crochet note, though, I will forever be thankful for organizations such as Project Linus. 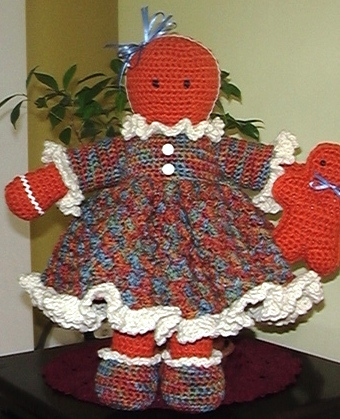 I would like to ask you to please support Project Linus in the 2010 Craft for A Cause contest! They could win $50,000! How great would that be for such a wonderful crochet organization! 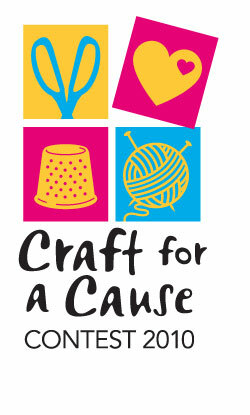 Please click HERE to go to the Joann’s Craft For A Cause website and vote! You can vote once per day on their website until December 4, 2010. Please take a moment each day and vote. $50,000 could go a very long way for such an independent organization! Project Linus has had a very special place in my heart for a few years now. When my mother was discharged from the trauma center into the rehab center after she was hit by a car, she had to travel by ambulance. The problem was that she had only her thin hospital nightgown to travel in and it was the middle of winter in New York! 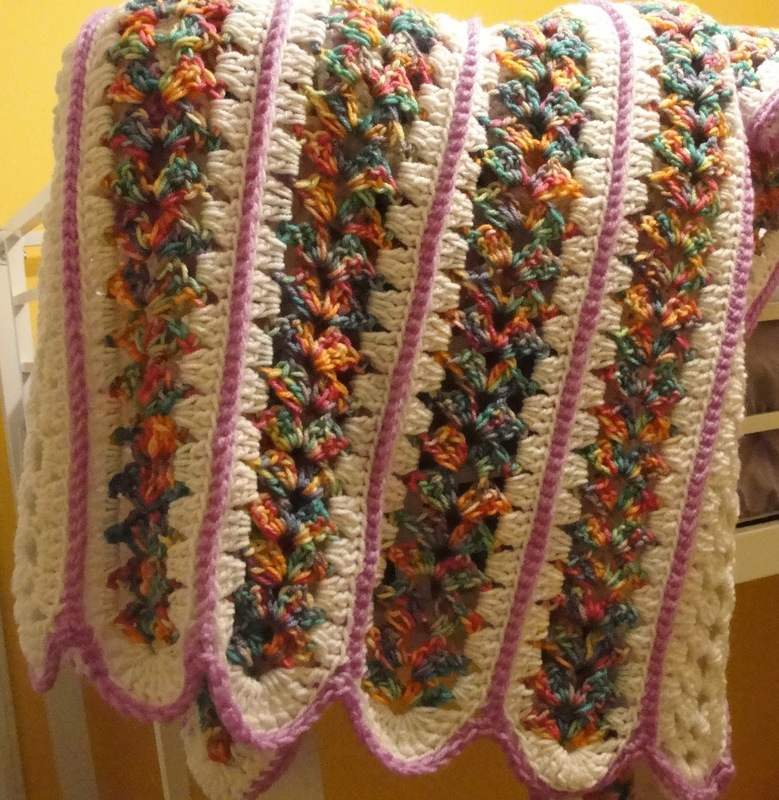 Her problem was solved when a wonderful therapist went down to the Services’ office and came back with a beautiful, warm, crocheted afghan that was tagged Project Linus! 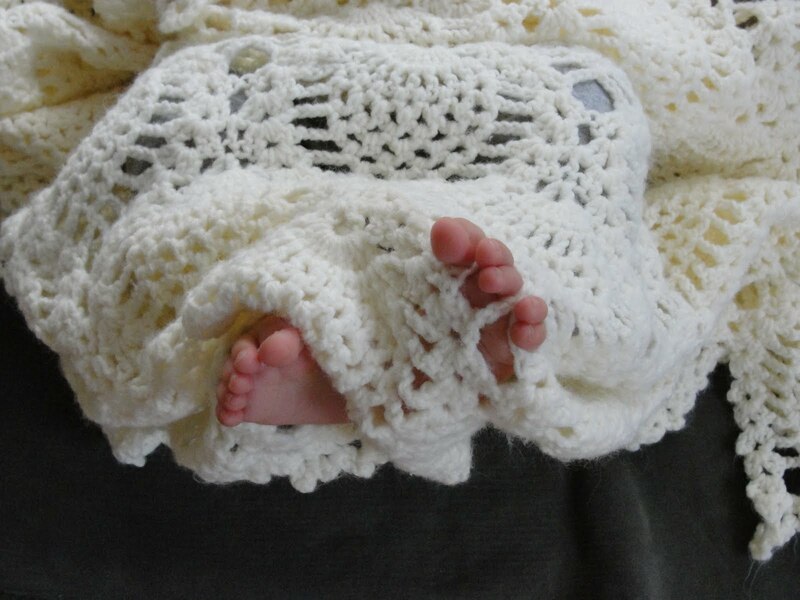 I could not believe that someone had lovingly made something so precious for a stranger! It was a beautiful thing (see photo above) and definitely served it’s purpose in keeping my mother warm AND still does! Thank you to all crocheters and knitters who lovingly donate their time, yarn and talent to such worthy craft causes! You may print it for your personal use, but you may not copy, distribute it, or sell it. Gauge: F hook; 9 sc = 2 inches; 5 rows = 1 inch. G hook; 4 sc = 1 inch; 4 rows = 1 inch. Rnd 1: (right side) Starting at top of head with Carrot and F hook, ch 5; 2 sc in 2nd ch from hook, sc in next 2 ch, 4 sc in last ch; working on opposite side of starting ch, sc in next 2 sc, 2 sc in last ch, join with a sl st to first sc, ch 1, turn. (12). Rnd 2: 2 sc in first sc, sc in next 4 sc, 2 sc in next 2 sc, sc in next 4 sc, 2 sc in last sc, join, ch 1, turn. (16). Rnd 3: 2 sc in first sc, sc in next 7 sc, 2 sc in next sc, sc in last 7 sc, join, ch 1, turn. (18). Rnd 4: (Sc in next 2 sc, 2 sc in next sc) around, join, ch 1, turn. (24). Rnd 5: (Sc in next 3 sc, 2 sc in next sc) around, join, ch 1, turn. (30). Rnd 6: (Sc in next 4 sc, 2 sc in next sc) around, join, ch 1, turn. (36). Rnd 7: (Sc in next 5 sc, 2 sc in next sc) around, join, ch 1, turn. (42). Rnd 8-14: Sc in ea sc around, join, ch 1, turn. (42). Rnd 15: (Sc in next 5 sc, dec over next 2 sc) around, join, ch 1, turn. (36). Rnd 16: Repeat Rnd 8. (36). Rnd 17: (Sc in next 4 sc, dec over next 2 sc) around, join, ch 1, turn. (30). Rnd 18: Repeat Rnd 8. (30). Rnd 19: (Sc in next 3 sc, dec over next 2 sc) around, join, ch 1, turn. (24). Rnd 20: Repeat Rnd 8. (24). Rnd 21: (Sc in next 2 sc, dec over next 2 sc) around, join, ch 1, turn. (18). Rnd 22: Repeat Rnd 8. (18). Rnd 23: 2 sc in ea sc around, join, ch 1, turn. (36). Rnd 24: (Sc in next 5 sc, 2 sc in next sc) around, join, ch 1, turn. (42). Rnds 25-42: Sc in ea sc around, join, ch 1, turn. (42). Rnd 43: (Sc in next 5 sc, dec over next 2 sc) around, join, ch 1, turn. (36). Rnd 44: (Sc in next 4 sc, dec over next 2 sc) around, join, ch 1, turn. (30). Stuff head and body firmly with polyester fiberfill. Fasten off. Rnd 1: With F hook, join Carrot with a sc in center back st of body of Rnd 42; sc in next 14 sc, ch 1; join with a sl st to first sc leaving remaining sts unworked; ch 1, turn. Rnd 2: Sc in ch 1, sc in next 15 sc, join with a sl st to first sc, ch 1, turn. (16). Rnds 3-20: Sc in ea sc around, join, ch 1, turn. (16). Begin stuffing leg firmly with polyester fiberfill. Rnd 21: (Sc in next sc, 2 sc in next sc) around, join, ch 1, turn. (24). Rnds 22-26: Sc in ea sc around, join, ch 1, turn. (24). Rnd 27: (Sc in next 2 sc, dec over next 2 sc) around, join, ch 1, turn. (18). Rnd 28: (Sc in next sc, dec over next 2 sc) around, join, ch 1, turn. (12). Rnd 29: (Dec over next 2 sc) around, (6), join with a sl st to first sc. Fasten off, leaving length for sewing. Sew opening closed. Rnd 1: With F hook, join Carrot with a sc in NEXT st of Rnd 42 (first unworked st of Rnd 1 of First Leg); sc in remaining 14 sc; sc in opposite side of ch 1 of Rnd 1 First Leg; join with a sl st to first sc, ch 1, turn. (16). Rnds 2-20: Sc in ea sc around, join, ch 1, turn. (16). Rnd 1: (right side) With Carrot and F hook, ch 5; 2 sc in 2nd ch from hook, sc in next 2 ch, 4 sc in last ch; working on opposite side of starting ch, sc in next 2 sc, 2 sc in last ch, join with a sl st to first sc, ch 1, turn. (12). Rnds 3-6: Sc in ea sc around, join, ch 1, turn. (16). join, ch 1, turn. (14). Rnds 8-23: Sc in ea sc around, join, ch 1, turn. (14). Fasten off, leaving length for sewing. Stuff arm firmly, flatten top and sew opening closed. Sew arm to each side of body. EYES: Using Black yarn and Satin Stitch, embroider eyes over Rnd 12, 1″ apart. ICING TRIM: Cut one piece of White Rick Rack 12” or long enough to fit around head from shoulder to shoulder. Glue Rick Rack around head, starting first end from one shoulder, around top of head, to opposite shoulder. Let dry. Cut two pieces of Rick Rack 5-1/2” or long enough to fit around wrist area of arm. Glue Rick Rack to each wrist of arm between Rnds 4 & 5, overlapping ends in back of wrist. sc in 2nd ch from hook and in ea ch across, ch 1, turn. (34). Row 2: Sc in first 6 sc, 3 sc in next sc, sc in next 4 sc, 3 sc in next sc, sc in next 10 sc, 3 sc in next sc, sc in next 4 sc, 3 sc in next sc, sc in last 6 sc, ch 1, turn. (42). Row 3: Sc in first 7 sc, 3 sc in next sc, sc in next 6 sc, 3 sc in next sc, sc in next 12 sc, 3 sc in next sc, sc in next 6 sc, 3 sc in next sc, sc in last 7 sc, ch 1, turn. (50). Row 4: Sc in first 8 sc, 3 sc in next sc, sc in next 8 sc, 3 sc in next sc, sc in next 14 sc, 3 sc in next sc, sc in next 8 sc, 3 sc in next sc, sc in last 8 sc, ch 1, turn. (58). Row 5: Sc in first 9 sc, 3 sc in next sc, sc in next 10 sc, 3 sc in next sc, sc in next 16 sc, 3 sc in next sc, sc in next 10 sc, 3 sc in next sc, sc in last 9 sc, ch 1, turn. (66). Row 6: Sc in first 10 sc, 3 sc in next sc, sc in next 12 sc, 3 sc in next sc, sc in next 18 sc, 3 sc in next sc, sc in next 12 sc, 3 sc in next sc, sc in last 10 sc, ch 1, turn. (74). Row 7: Sc in first 12 sc, ch 5, skip next 14 sc, sc in next 22 sc, ch 5, skip next 14 sc, sc in last 12 sc, ch 1, turn. (10 ch, 46 sc). Row 8: Sc in ea sc and ch across, ch 1, turn, (56). Rows 9-11: Sc in ea sc across, ch 1, turn. (56). Row 12: Working in Back Loops only, 3 sc in ea sc across, ch 1, turn. (168). ch 1, turn. (56 shells). Rows 14-26: (Sc, 2 dc) in first sc, ** (sc, 2 dc) in next sc; repeat from ** across, ch 1, turn. (56 shells). Row 27: (Sc, 2 dc) in first sc, ** (sc, 2 dc) in next sc; repeat from ** across, changing to Aran in last st made, ch 3, turn. (56 shells). Row 1: With Aran, dc in same pl as turn ch, 2 dc in ea st across, ch 1, turn. (336 dc). Row 2: Sl st in first dc, (ch 3, sl st in next dc) across. Fasten off. Row 1: With right side of Dress and neckline facing and F hook, join Aran with a sl st in first st on opposite side of starting ch; ch 3, dc in same ch, working across neckline on opposite side of starting ch, 2 dc in ea ch across, ch 1, turn. (68 dc). Row 2: Sl st in first dc, (ch 3, sl st in next dc) across to last st, ch 3, sl st in top of turning ch. Fasten off. Rnd 1: With right side facing and F hook, join Sierra with a sc in any st skipped from Row 7; make 22 more sc (for a total of 23) around armhole opening; join with a sl st to first sc, ch 1, turn. (23). Rnds 2-10: Sc in ea sc around, join, ch 1, turn. (23). Rnd 11: Sc in ea sc around, changing to Aran in last st made of Rnd 11, join with a sl st to first sc, DO NOT turn. Rnd 1: With Aran, ch 3, dc in same place as joining, 2 dc in ea st around; join with a sl st to top of ch-3, ch 1, turn. (46). Rnd 2: Sl st in first dc, (ch 3, sl st in next dc) around; join with a sl st to first sl st.
Sew 2 buttons to front center of bodice as shown. Place dress on doll. Overlap back ends of dress and sew in place. Rnd 1: With Sierra and G hook, ch 2, 6 sc in 2nd ch from hook, join with a sl st to first sc, ch 1, turn. (6). Rnd 2: 2 sc in ea sc around, join, ch 1, turn. (12). Rnd 3: (Sc in next sc, 2 sc in next sc) around, join, ch 1, turn. (18). Rnd 4: (Sc in next 2 sc, 2 sc in next sc) around; join, ch 1, turn. (24). Rnds 5-11: Sc in ea sc around, join, ch 1, turn. (24). Rnd 12: (Sc in next 2 sc, dec over next 2 sc) around, changing to Aran in last st made join, turn. (18). Rnd 13: With Aran,ch 3, sl st in Front Loop only of first sc, ch 3, (sl st in FLO of next sc, ch 3) around; join with a sl st to base of starting ch-3. Fasten off. Cut 1/8” satin ribbon into 4, 12” pieces. Set one piece aside. Holding 3 remaining pieces together as one, tie into a bow. Sew bow to side of head as shown. Row 1: Starting at feet, ch 3, sc in 2nd ch from hook, sc in last ch; ch 1, turn. (2). Row 2: 2 sc in first sc, 2 sc in last sc, ch 1, turn. (4). Rows 3 & 4: Sc in ea sc across, ch 1, turn. (4). At end of Row 4, fasten off. Turn. Repeat Rows 1-4 of First Foot; DO NOT fasten off, ch 1, turn. Row 5: Sc in ea sc across; working in sts of Row 4 of first foot, sc in ea sc across, joining both feet together, ch 1, turn. (8). Rows 6-8: Sc in ea sc across, ch 1, turn. (8). Row 9: Sc in ea sc across, fasten off, Turn. (8). Row 10: Ch 3, sc in ea sc across sts of Row 9 of Body, ch 4, turn. (7 ch, 8 sc). Row 12: Sc in ea sc across, ch 1, turn. (14). Row 13: Dec over first 2 sc, sc in ea sc across to last 2 sc, dec over last 2 sc. Row 14: Skip first 4 sts of Row 13; join Carrot with a sc in next sc, sc in next 3 sc, ch 1, turn, leaving rem 4 sc unworked, ch 1, turn. (4). Row 15: 2 sc in first sc, sc in ea sc across to last sc, 2 sc in last sc, ch 1, turn. (6). Rows 16-18: Sc in ea sc across, ch 1, turn. (6). Row 19: Dec over first 2 sc, sc in next 2 sc, dec over last 2 sc, ch 1, DO NOT turn. Rnd 20: Working in ends of rows and in ea sc, sc around outer edge of body; join with a sl st to first sc. After first side, fasten off. After second side, DO NOT fasten off. Holding both body sides with wrong sides together and working in BOTH Back Loops only around, sl st in Back Loops only joining sides together and stuffing body with polyester fiberfill before closing. Join with a sl st to first sl st and fasten off. Using Black and French Knot, embroider eyes between Rows 17 and 18, ¾” apart. Tie remaining 12” satin ribbon into a bow. Sew bow to front neckline of gingerbread. Trim ends. Using tapestry needle and Carrot yarn, tack Gingerbread to hand of gingerbread doll. Happy Autumn! Join us for our most recent LINKY LOVE for FALL needlecraft projects. If you have any type of crochet/knit/sewn/handcrafted pattern or finished item, either for sale or for free, join this post! Just click on the ‘Add Your Link’ button below and follow the instructions! I have done the first few for you to give you an example! The ability to post to this Linky Love will expire on November 30, 2010. JOIN US!